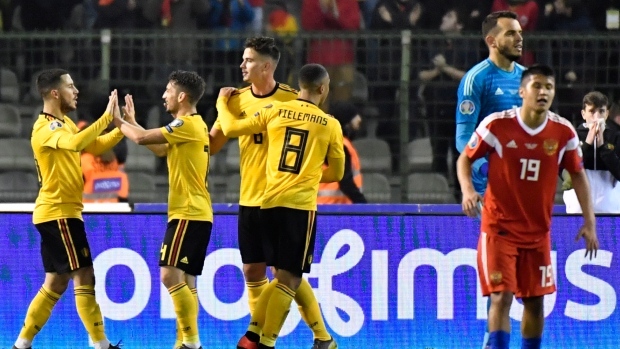 Youri Tielemans' early goal for Belgium was cancelled out when a Courtois gave away the ball in a rare blunder which allowed Russia's Denis Cheryshev to score. A new-look Russia team struggled to track Hazard and when defender Yuri Zhirkov tried, he ended up tripping the Belgian and giving away a penalty which Hazard converted. Azerbaijan then sat back to defend, frustrating Croatia, who came close with headers from Andrej Kramaric and Luka Modric. Croatia finally levelled in the 44th thanks to Borna Barisic's quick reactions to jab the ball in on a rebound.